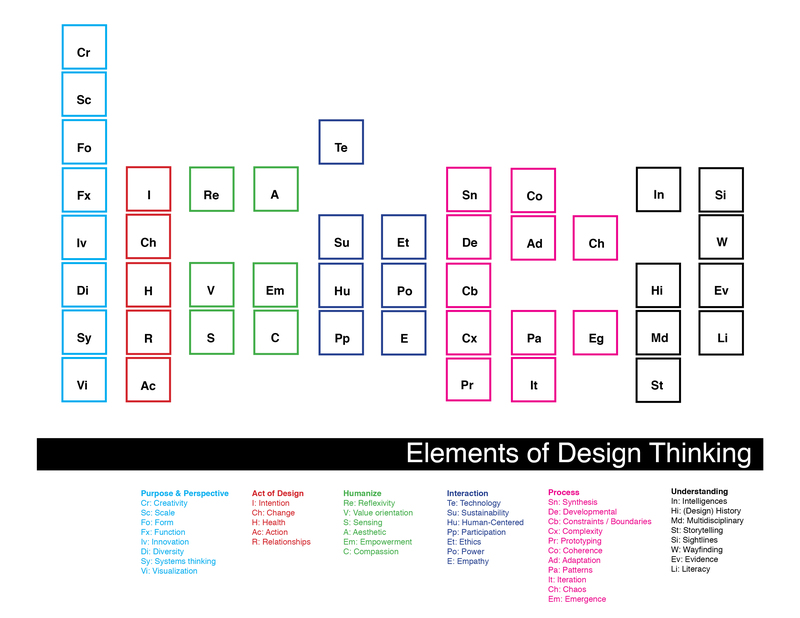 My colleague and design collaborator has proposed a way of viewing design thinking as something akin to a periodic table of elements. Beyond just posing a brilliant way of explicating and organizing the multiple facets of design thinking, Andrea Yip has shown the world that there is much we can learn from science, visualization and how they both apply to design. Last weekend a group of design thinkers got together to discuss the concept of design thinking and what it means. The conference, summarized in another post, explored the language of design thinking, the need for visual thinking, and the importance of understanding the context of design and design thinking. While this was going on in Vancouver, another designer (my colleague, Andrea Yip) was back in Toronto taking these same ideas independently and transforming them into an organizational structure that should create much room for thought among those interested in design thinking. The model she has developed is one not based on areas that are familiar to design — architecture, art, graphic design, business strategy, or engineering — but science. Designers often speak of a need for multidisciplinarity in their work. While laudable, this commonly refers to the inclusion of multiple perspectives on a design problems from within the broad field of design. It is indeed rare to find such multidisciplinary teams comprised of scientists. Andrea has turned that upside down by proposing a model of design thinking based on the periodic table of elements. The table, shown below, is a first draft, but a highly sophisticated one and something that ought to be taken seriously. By using the structure and format of a bedrock of science, Andrea has shown that there are ways of thinking about design that transcend the boundaries that we often unconsciously bind around it. This new model inverses the terms posed by the creative arts or the applied disciplines of engineering or architecture, each that have made enormous contributions to the field, yet all rely on a level of subjectivity, and replaces them with a model based on a more universal language: science. Science and design are uneasy partners. Some, like Nigel Cross, have pointed to the challenges with the use of terms design science and the science of design, while others, like Buckminster Fuller, use the term design and science in ways that are open to challenge from those who identify as practicing scientists. Ms Yip, a designer trained in science (biology) and social science (health promotion) fields, sees things in ways that transcend these perspectives to propose using science as a guide to inform the way we understand design. In doing so, she provides a bridge between the worlds of science, with its emphasis on evidence and strict adherence to protocols, and design, with its flexible, rapidly evolving, yet often non-specific methods. Indeed, Andrea’s blog showcases many examples of how design and fields like health promotion fit together and differ. It is time for both designers and scientists to listen more intently to this conversation. By using methods, theories, analogies and conceptual models that extend our thinking beyond the realm of conventional design and science, we offer opportunities to make things better — and in doing so shape our world for the greatest benefit for us all. Andrea’s blog is called Drawed and can be visited at: http://drawedit.wordpress.com/ . She welcomes feedback on her ideas. And if the Periodic Table of Design is not enough, Andrea’s also developed a prototype set of trading cards based on the table for those more inclined to school-yard forms of collaborating around design that are also up on her blog. For more dialogue on design thinking, stay tuned to this space and the Twitter feed @d_bracket for the upcoming launch of the Design Thinking Foundations project and corresponding site. And wouldn’t you know? Andrea Yip is the coordinator of that project. Design commentator Bruce Nussbaum shook up the world of design thinking this week arguing that it is a “failed experiment” and that Creative Intelligence is an appropriate term to replace it. What might this mean for design and its increasing role beyond its traditional boundaries? I am defining Creative Intelligence as the ability to frame problems in new ways and to make original solutions. You can have a low or high ability to frame and solve problems, but these two capacities are key and they can be learned. I place CQ within the intellectual space of gaming, scenario planning, systems thinking and, of course, design thinking. It is a sociological approach in which creativity emerges from group activity, not a psychological approach of development stages and individual genius. This proposal comes from a visible frustration with the way in which design thinking has been taken up as a tool with the critical component — creativity — left out in the cold. But it was creativity that Design Thinking was originally supposed to deliver and it is to creativity that I now turn directly and purposefully. Creativity is an old concept, far older than “design.” But it is an inclusive concept. In my experience, when you say the word “design” to people across a table, they tend to smile politely and think “fashion.” Say “design thinking,” and they stop smiling and tend to lean away from you. But say “creativity” and people light up and lean in toward you. Nussbaum clearly struck a chord with many. Within hours of the article being posted, dozens of comments were posted to the site, with most favouring the cause of creativity over design thinking. Creativity is generally viewed as an inherent quality within a person; there’s a notion that you find out early in life whether you are creative or not. How many times have you heard a business person say “I am not creative” in a meeting? The concept of “Creative Intelligence” (or CQ) extends that model by implying that our level of creativity can be assessed in a quantitative manner similar to an IQ score. By bringing creativity into the sphere of assessment, I fear that CQ will ultimately suffer a similar fate as Design Thinking. Fabricant worries about the institutional co-optation of the term CQ much as design thinking was/has/is by many in the business world. While I respect the efforts to extend the creative power of design beyond the confines of mere terms, the rhetoric of pro- or anti-design thinking has already left me exasperated. It is evident that many are dissatisfied with what design thinking hasn’t brought and how it has been used, but my concern is that we may be throwing the baby out with the bathwater and undoing the good it has done by claiming such things as it being “a failed experiment” . I argue that it never had the chance to be fully implemented in the first place, nor have we ever raised it to the level where any scientist (behavioural or otherwise) could claim an experiment ever took place. I’m nit-picking the words because that is exactly what the design thinking critics have done, but in this case I am arguing for more research not a new term. What are the central theoretical foundations of design thinking? How does design thinking map on to what is known about how people change their behaviour? or organize in groups, teams and communities? In what ways does the science of complexity and system dynamics fit with the design process? What are the personality and delivery variables that influence an acceptable facilitated design process? What is “success” in a design thinking intervention? None of these questions have been answered. Books have been written, talks have been given, and magazines fill themselves with articles on design thinking, yet in all my intellectual travels I have not found answers to these questions. As a behavioural scientist and emerging design practitioner myself, I would rather know these answers before making such claims to abandon the idea. Further, the concept of CQ is, as Robert Fabricant noted, fraught with pitfalls ahead. Every time a new “intelligence” is introduced, the rush to assess it, measure it and teach it produces a wave of scholarship aimed at tree-loving rather than forest appreciation. Where I think design thinking could have gone further was not so much in instilling/harnessing/discovering creativity, rather in getting people to consider the systems that people fabricate to do creative work in. The main tenet of design thinking is empathy for the people you’re trying to design for. Leadership is exactly the same thing–building empathy for the people that you’re entrusted to help. Once you understand what they really value, it’s easy because you can mostly give it to them. You can give them the freedom or direction that they want. By getting down into the messy part of really getting to know them and having transparent discussions, you can get out of the way and let them go. The way I would measure leadership is this: of the people that are working with me, how many wake up in the morning thinking that the company is theirs? Of the few that have managed to traverse this area between design, creativity, and science is Keith Sawyer at Washington University in St. Louis. Check out his books on the subject. What good is design and why should non-designers care? These are questions that designers ask a lot. As one who has developed his practice of design within public health (the behavioural sciences focus), I come from a world where the term “design” is viewed with disdain at worst or indifference or curiousity at best. The concept doesn’t resonate with that audience…yet. As a designer of systems to promote the health and wellbeing of individuals through helping them solve complex problems individually and groups I find myself attracted to others who try to do the same, even if it is often from a perspective and focus other than health. That gets me into the world of graphic and industrial designers, interaction designers, and now those who use the term social designers or humanitarian designers. Not surprisingly perhaps, this interaction brings with it much learning for me as it enables me to receive the gifts that diversity brings. The language, the culture and the context of design in design programs, studios and conversations is thrilling for me. As business has joined the conversation, that diversity has increased and programs like OCADU’s Masters in Strategic Foresight seem to capture this type of interaction between what might be called traditional and non-traditional design space. 1. Designers care a lot about what others think they do and spend an inordinate amount of time coming up with definitions and terms used to describe their craft. On one hand, this is useful and encouraging to see such interest in communicating with the world the value of design, but what could be viewed as attention to education could also be seen as a sense of drifting priorities and a lack of focus or confidence within the field. This intense interest in using rhetoric to show the world designs value, exemplified in the videos, myriad books on design processes, thinking, types, and models is all useful to novices and getting the word out, but at some point the data need to speak. 2. Designers use the concept of “interdisciplinary” very differently than I do. I thought public health had a case of the interdisciplinary-itis, but clearly its endemic across different disciplines and fields and that the way it is used is very different. I already knew this from my own research that has looked at how interdisciplinary researchers collaborate on science problems, but it never ceases to amaze me how the terms get used in other fields and contexts. In design, interdisciplinary often means mixing graphics design folk with industrial designers and visual artists. Taken one step further and you get the IDEO model that expands this to include different fields like anthropology and engineering. This is much closer to what I think of when I consider interdisciplinary, but that is much more rare than I originally thought I’d find in the design world. 3. Designers have a strange relationship with psychology. The use of the word “empathy” is far more common in design than in public health. That excites me for design, but saddens me that it is so rare in public health, but I digress… Yet, while designers are great at getting to know their audience, the methods they use are rather small. Much of it relies on ethnographic study and (from what I can tell) fuzzy qualitative data collection. The methodology is not problematic, but the execution might be. In academia, particularly academic psychology (where I was trained), we are encouraged to explore two things in great depth when appraising others’ research: 1) the rigor of the application of method and analysis, and 2) the use of theory. In both cases I have found design research lacking. What is the theory of change or design used? How was the data analyzed? Why was [this] method used over [that] one? I rarely get good answers to this — at least the kind that my academic colleagues would appreciate. Designers need behavioural scientists to help them step up their game as much as the world needs designers to help behavioural scientists step up theirs. Many of the reasons I love design is that it goes to places where academia fails to look and where the public often lives. Many of the design methods and processes like sketching user experiences, empathic research and engaged interaction with clients are things that public health and other fields need to do. Many academics are so far removed from the real world that we’ve left little reason for the public to WANT to engage us. But the downside is that we’ve taken many of the theories, methods and tools that we’ve honed over thousands of trials and studies and produce some good data and synthesis with us. Designers need us to help them step up their game as much as we need designers to help behavioural scientists step up theirs. As the holidays approach I’ve been spending an increasing amount of time looking at a field that has become my passion: design. Design is relevant to my work in part because it frequently deals with the complex, requires excellent communication, and as Herbert Simon would suggest, is all about those interest in changing existing situations into preferred ones. Yet for all the creativity, innovation and practicality that design has I find it lacking in a certain scientific rigour that it requires to gain the widespread acceptance it deserves. This is not to say that designers do not employ rigorous methods or that there is no science informing design. 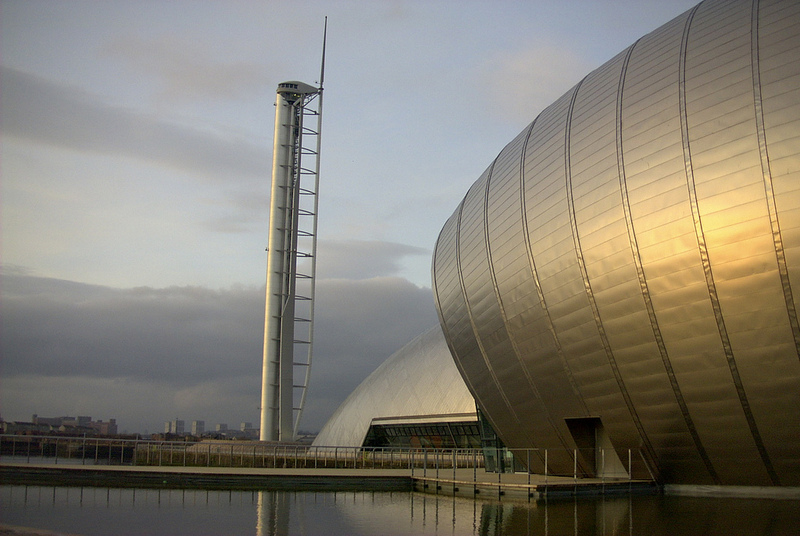 For example, architecture, a field where design is embedded and entwined, employs high levels of both rigour and science in its practice. The issue isn’t that these two concepts aren’t applied, they just aren’t applied to each other. I was heartened this week to see Dexigner profile a new pamphlet on the science of design. Although true in spirit, it wasn’t what I expected to see as it largely profiled ways to assess the quality of design projects from the perspective of design. What if we could assess the impact of design on a larger scale, a social and human scale? Interaction designers speak of this need to connect to the human in design work. The emergent field of social design exemplified by groups like Design 21 who aim to produce better products for social good. All of this is important, but it’s important largely because we say it is so. Rhetorical arguments are fine, but at some point design needs to confront the problem of evidence. Does “good” design lead to better products than “bad” design? What components of design thinking are best suited to addressing certain kinds of problems? Or are there simply problems that design thinking is just better at addressing than other ways of approaching them? 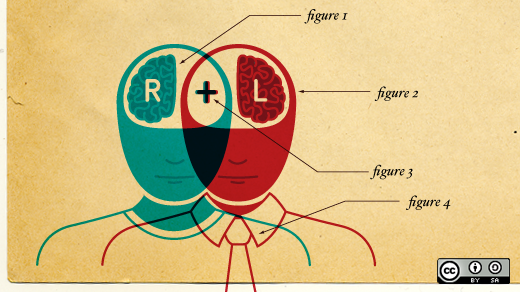 What methods of learning produce effective design thinkers? And what is effective design thinking anyway? Does it exist? What is the comparative advantage of a design-forward approach to addressing complex problems than one where design is less articulated or not at all? These are just some of the many questions that there seems to be little evidence in support of. A scientific approach to design might be one of the first ways of addressing this. In doing so, a scientifically-grounded design field is far more likely to garner support of decision makers who are the ones who will approve and fund the kind of projects that can have wide-scale impact. Design is making serious in-roads to fields such as business, education, and health, but it represents a niche market when it has the potential to be much larger. Roger Martin has argued that the reliance on scientific approaches to problem solving runs counter to much of design thinking. This assumes that science is applied in a very detached, prescriptive manner, which is common, but not the only way. Micheal Gibbons and colleagues have described two forms of science, which they call Mode I and Mode II science. The first Mode is the one that most people think of when they hear the term “scientist”. It is of the (usually) lone researcher working in a lab on problems that are driven by curiosity with the aim of generating discoveries. For this reason, it is often referred to as discovery-oriented research. Mode 2 research is designed to be problem-centred and aimed at answering questions posed by practical issues and has a strong emphasis on knowledge translation. This is an area more accustomed to the designer. Design presents the opportunity to transcend both of these Modes into something akin to Mode 3 research, which I surmise is a blend of the abductive reasoning inherent in Roger Martin’s view of design thinking and the discovery-oriented approach that goes beyond just the problem to create value beyond the contracted issue. A design-oriented approach to the science of design would involve leveraging the creative processes of designers with some of the tools and methods accustomed to researchers in Mode 1 and 2 science. Can we not do detailed ethnographic studies looking at the process of design itself? Is there any reason why we cannot, with limits acknowledged and in appropriate contexts, attempt to do randomized controlled trials looking at certain design thinking activities and situations? If design is to make a leap beyond niche market situations, a new field must dawn within design + science and that is the science of design and the design of science.